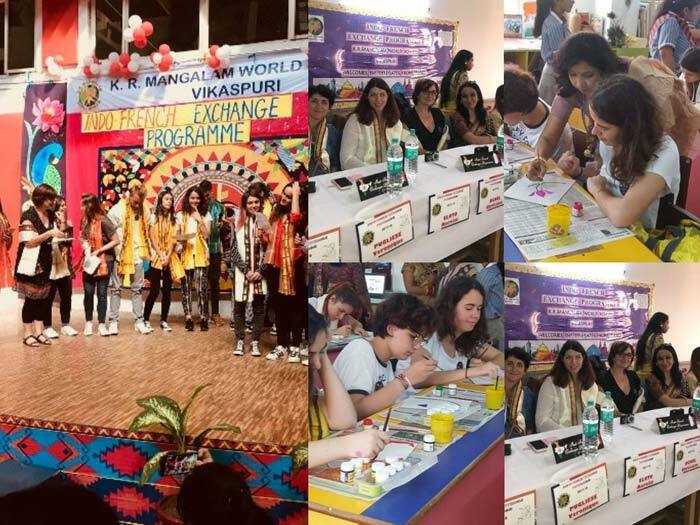 After a cordial reception of the French Delegates at IGI Airport on 15 October,2017, their day 2 began with an amiable welcome in K.R.Mangalam World School, Vikas Puri by our august Principal Mam and staff members. Being a cultural exchange program, the welcome too was in a complete Indian way i.e. the traditional tilak ceremony and garland ceremony of the delegates. A welcome assembly was organised in the Amphitheatre by class IX & X in honour of our guests. “Music knows no language”, and the music played by orchestra group of K.R.Mangalam School was an initiative of our acquaintance. It was followed by a song performance by the French students and teachers. Our Indian cultural dance was presented graciously by KRM students. The assembly was concluded by National anthems of both the nations honourably. A sumptuous breakfast was offered to the French Delegates, which was quite relishing. Succeeding the savouring breakfast was an interactive session between French and Indian students in the multipurpose hall. It was a fantastic prospect of familiarizing with each other. Students from France and our school introduced each other. It was really a worthy experience. The Athletic Meet 2017-18 was arranged by the host school. The participants were from the students of class IX-XII. Sports inculcate spirit de corps. The French students were nowhere behind cheering up the host team. This is what we call a true sportsmanship. Once the sports meet accomplished successfully, the French students were divided in two groups i.e. Group 1 & 2. Group 1 was headed towards Indian painting-Madhubani. Painting is a mode of creative expression and the forms are numerous, one such form is Madhubani. Madhubani is practiced in Mithila region of India. Painting is done with fingers, twigs, brushes, nib pens and matchsticks using natural dyes and pigments. It was a mesmerizing experience.The group 2 was headed towards the home science lab to participate in Indian cuisine cooking.Later the Indian cuisine was presented in one of the class rooms, and enjoyed the delicious cuisine. After enjoying the food the French delegates were taken to the luxury train The Maharaja Express.At 5 pm they came back to school.The host families were waiting for the delegates to welcome back to their houses.